Set on 21 landscaped acres overlooking the South Shore in Paget parish, Coral Beach stands out as a haven for avid players. Its eight clay courts, three with lights, are the social heart of this intimate property. Guests bed down in one of 13 cottages (with from one to five bedrooms) interspersed throughout the gardens or in one of the 32 rooms and suites, whose private terraces have views of the pink-sand beach and turquoise ocean below. There are two dining options on site (jacket and tie requested for gentlemen in the evening), a bar, and a games room as well as a fitness center and boutique spa. The club dates to 1948 when it was constructed on land that has belonged to Bermuda's Smith family for eight generations. The oldest structure on the property, called Old Farm, was built in 1650l. The first tennis courts came along in 1939 and were soon the venue for an invitational tournament. 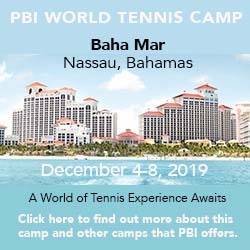 From 1995-2008, it staged the XL Bermuda Open, an ATP event, and it continues to host adult and junior tournaments at various times of the year. Lodging consists of rooms, suites, and 1-to-5-bedroom cottages. Rates include breakfast. Seasons. Year-round, but best from March through October. So far, I haven't received any written feedback on Coral Beach & Tennis Club. If you've taken a tennis vacation there, I'd like to hear your reactions.